Hint for new parents: finished artwork can often be found on the red drying table next to the BY outside art shelves, on the bench next to the garden, or hung up on clothespins on the deck. Also check the FY art box, inside on the top-left corner of the art shelf (on the wall between the entrance and the door to the bathroom). We’ve also had a variety of building, manipulative and sensory materials out: gear builders, blue sand “water” and sea creatures, calico critters of the country vs. city (tree houses & apartment buildings) and lincoln logs + playmobile people. Inside, we’ve had a variety of puzzles and magnet toys out, rotating alongside our permanent toy collection. It has not taken long for our new students to discover the joys of stripping down and getting completely all-over mucky in the lower level. We start afternoons with a short gathering called Greeting Meeting, during which we sing a song and make announcements including whether the day is hot enough to get down to underwear or go “halfsies.” 1pm-3pm tends to be the hottest part of the day and we’ve stayed cool with lots of water play including rivers, lakes, volcanoes, water slides, and straight-up jumping through the hose. (And breaks to drink water, of course.) Water has also featured prominently in food creation, with many elaborate meals and treats prepared around our playhouse. Lately there have been a lot of superheroes, ninjas, families, construction workers, jaguars, and caretakers of dinosaur and black widow eggs. 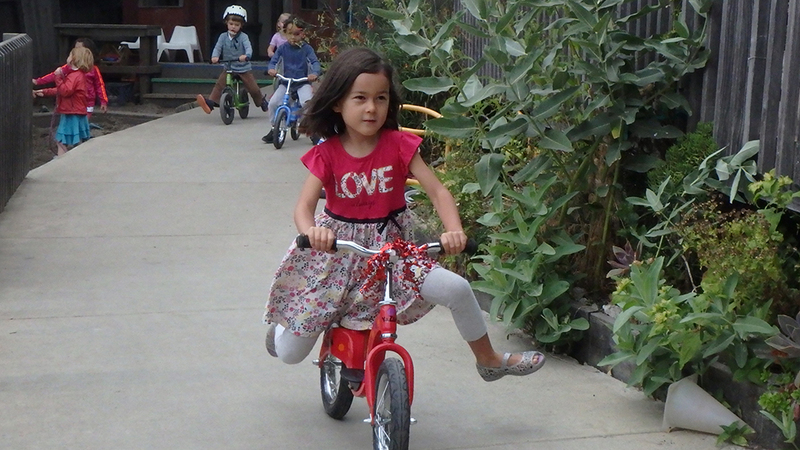 Bikes have also been popular, and front yarders are getting used to the bike rules (shoes on, one way). Group Time typically starts between 3-3:15, and lasts until 3:30 pick up. While Auden has been out, children have been enjoying two Brian stories per week, on Monday and Wednesdays! We’ll talk more about afternoon storytelling in a future article. On Fridays our wonderful guest teacher Laura has been leading children through some music and movement (called “Listen and Move” if you want to try it at home!) and playing Bug Under the Rug, where the kids take turns being the guesser, the bug under the rug, and clue-givers. Laura’s also practiced a little bit of meditation with the children, challenging them to listen quietly to the sound of the gong and raise their hands when they can no longer hear it. Meanwhile, at my group times on Tuesdays and Thursdays we’ve had a mix of oral storytelling, books, felt board, and story songs. I’ve also brought my friend Sky out once per week. Sky is a persona doll who goes to a school similar to CCC, called DDD. Children have been very helpful to Sky as he adjusts to his new school, giving him advice on a range of topics including making friends, being scared of thunder (the day after our own thunderstorm), letting people know when they’re being too rough or when you don’t like something, and having confidence when other children called his drawings “just scribbles” (that last issue was suggested by a child!). We’ve also had some puppet guests, including art critic Little Louis the mouse/rat and Grog and Stinklefoot, bickering monster friends. At 3:30 pick up, we encourage children to wait until their grown ups come into the room to pick them up, so as to avoid a stampede to the door. Reminder that this transition time can be challenging for children who are staying for tea time. Please help it go as smoothly as possible by taking your kids up to the hill or out of the school as soon as you find their shoes and belongings, rather than starting to play in the classroom. At tea time, children have been making ramps and block constructions with Brian, playing hide and seek, taking out musical instruments, and joining in sustained group fantasy play. By the time this article circulates in the newsletter, Auden will be back! We have missed her deeply and are thrilled for her return.